Today’s post comes from our very dear friend Carol. 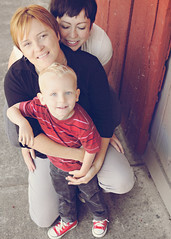 She was a special friend to Caemon and an incredible support to Jodi and I both in the hospital and after Caemon died. Her presence during Caemon’s treatment and her countless efforts to help support our family in innumerable ways during the course of Caemon’s treatment will always be a treasured gift to us. Below, our beloved friend shares Caemon’s impacts on her. I met Caemon before he was born – really, before he even was conceived. Jodi and Timaree wanted so much to be parents, were so sure that this was their path, and so dedicated to making it happen. Their child was a tangible presence before he arrived on Earth. I was overwhelmed with joy when they shared their news. Timaree was pregnant and the embodiment of Mother, and Jodi equally diligent and dedicated to being Mama. I remember the day they showed me his room, which also revealed his name and its meaning. C A E M O N was spelled out in colorful wooden letters, and a large stuffed crocodile was waiting for him. When he was born, I visited them at the hospital and got to hold him when he was barely 24 hours old. I never dreamed that just three years later the four of us would again be sitting together in a hospital room. I am one of the lucky ones that knew Caemon. I have more treasured memories than I can list here: making cakes for all three of his birthdays; walking along with him in a stroller sucking my finger when he was teething; playing in his room on what turned out to be his last day at home; sharing a special crystal just before his transplant; a magical connection while napping with him just days before he died. The last treats I baked for him were cream cheese brownies. He loved them. I promised to make them again when he finished his treatment and felt well enough to eat. When Caemon was diagnosed with JMML, I knew I would be showing up in some big way for this journey. I was so grateful to be able to help: I created his Facebook page, did fundraising, and spent time at the hospital for several hours every week. Those visits were precious and also could be very intense. While I found myself rising to the challenge of this, I was astounded at what I witnessed in Timaree and Jodi. My experience was the tiniest sliver of what they were going through. I am still in awe of the tremendous love that fueled them through more trials on every level than I can begin to describe or imagine. To be able to give even a small amount of support was humbling. They are a testament to the power of unwavering love. I received so much during this time. Not only from Jodi, Timaree, and Caemon, but from new friendships, relationships that deepened, and the experience of spectacular loving kindness that flowed with beauty and force from all directions. People are capable of such extraordinary love and generosity, and it seems we are just waiting for an opportunity to show that. My spiritual beliefs include the idea that the Universe has a bigger plan, that we are all connected, and that no matter what happens, there is purpose and choice. Caemon’s illness and death tested me. I was furious when he died. Why did he have to suffer so much and die so young? Why was his incredible potential snuffed out? Why did his parents, who wanted him more than can be measured and did everything to deserve a happy ending, have to endure this grief? It was so incredibly unfair. But in the end, I still believe in a loving Source and a choice made by our souls as part of a much bigger picture than this one life on Earth. It doesn’t make his absence less painful. But I know that Caemon’s soul still shines, that his short life had and continues to have a great impact on so many, and that because of what happened, more people were transformed without ever meeting him than maybe would have been had he lived much longer. This helps give me perspective and some peace. In spite of how I still feel about this outcome, my love for and trust in something bigger than us remains strong. The incredible courage of his soul to come to Earth, knowing what was in store, tells me he knew it was worth it. Yes, I wish Caemon were still here. I wish I were making him birthday cakes and cream cheese brownies. I wish his moms didn’t have to live with this gaping hole in their hearts. And I also know his life had a purpose that continues to unfold through his soul, his legacy, and through those of us who are better for having been touched by him. Recently I had a dream about Caemon. I was in the bottom part of a split-level room, and he came over to me. It felt so lovely to hold him. He spoke to me in a child’s voice that gradually became more articulate and mature. While I don’t remember his words, the memory in my body is of wisdom and comfort. And then he had to go. He climbed up to the level above me and scampered off with a couple of other children. In my dream, I was okay with that. 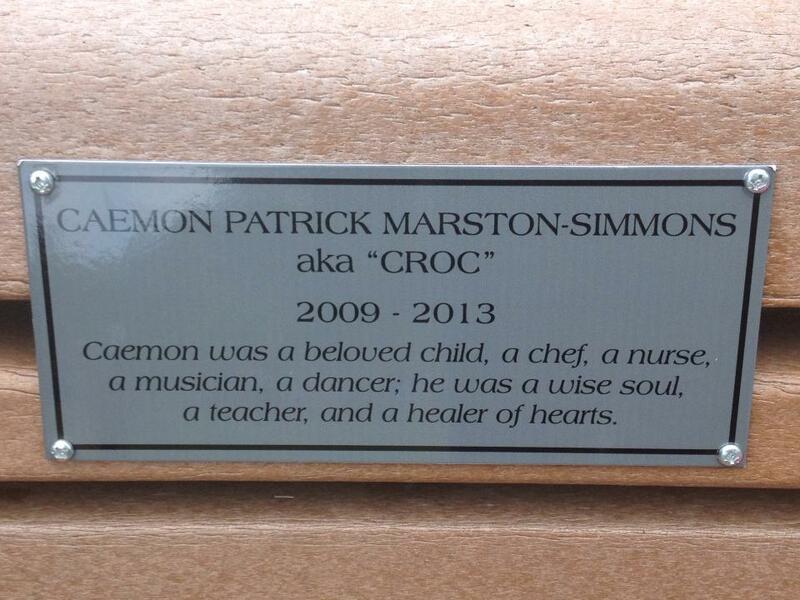 This entry was posted in Uncategorized and tagged Caemon, Caemon's Legacy, Caring for Caemon, childhood cancer, community on March 21, 2015 by T.
Immediately after Caemon died, a community of bloggers crowdfunded for a permanent plaque which was affixed to a bench at the Oakland Children’s Zoo, directly across from the American Alligator (crocodilian order) exhibit. We have visited this bench, held children in our laps while sitting on it, and yes, we have cried here too. It is a hard thing to see; for some reason, seeing something in writing makes it so much more real, and seeing our son’s name indelibly etched onto a memorial plate makes me wince to this day. But this bench, my son’s very own bench, is special too. Caemon was not buried, so there is no gravesite to visit, but here we have a physical place we can go to feel close to him, and so too does anyone else who wishes to visit. Our friends have taken their children to this special spot and talked to them about Caemon. We love seeing pictures of kids crawling all over his bench and gazing in wonder at the fierce animal after which this boy was named. It’s a gift we cherish immeasurably and are humbled and grateful to the community that made it happen. This part of Caemon’s legacy will leave its mark on anyone who sits for a moment under the cooling shade of the overhead tree and reads these words: Caemon was a beloved child: a chef, a nurse, a musician, a dancer; he was a wise soul, a teacher, and a healer of hearts. This entry was posted in Uncategorized and tagged bereaved parents, Caemon, Caemon's Legacy, childhood cancer, community, grief, memorials on February 22, 2015 by T.
Caemon made many in his Great Circle see the sunrise a little differently. When Angela and I traveled up the mountain with Carol, to watch Caemon’s special sunrise over Sonoma, we could not have hoped any harder, prayed any harder, or loved any harder, a little boy we never even had a chance to meet. When I see the sunrise, I will forever think of Caemon, and the love I had for him in those moments. Sunrise on “The Sunrise Minute for Caemon” day, taken by one of our nurses. You can see two nurses’ reflections in the window. This entry was posted in Uncategorized and tagged Caemon, Caemon's Legacy, childhood cancer, community, grief, guest bloggers, hope, sunrise on February 14, 2015 by T.